Aug. 9, 2018—Do your arthritic knees ache under the strain of excess pounds? If so, you may already know: A weight loss of just 10 percent may help to ease your pain and improve your ability to get around. That's a great goal. But why stop there? 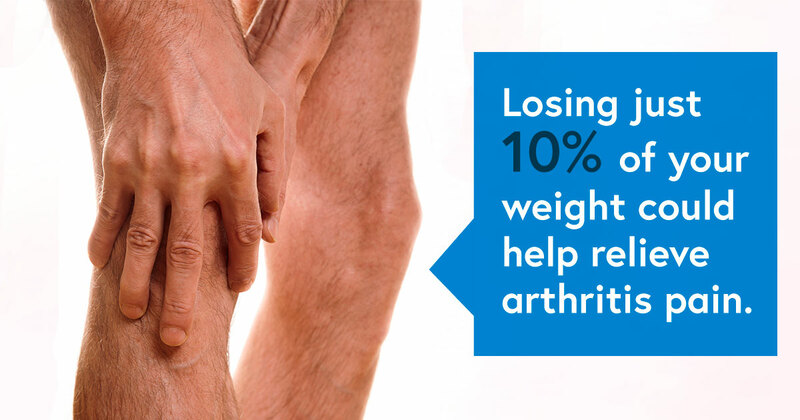 Researchers recently took another look at data on knee arthritis and weight loss. They found that people who doubled that weight loss—through doable changes in their eating and exercise habits—saw their arthritis symptoms and quality of life improve even more. The more weight lost, the more the participants' pain decreased and the farther they could walk. People who lost about 20 percent of their weight gained an extra 25 percent reduction in pain, when compared to those who lost about 10 percent of their weight. Those who lost 20 percent of their weight also had less inflammation than those who shed fewer pounds. If you have knee OA, ask your doctor what's a healthy weight for you. If you do need to slim down, dropping as many pounds as the people in the study did may not be easy. (For a 250-pound person, a 20-percent weight loss is 50 pounds). But it's definitely doable—and potentially rewarding—as the research suggests. What's more, many people may be able to achieve such a goal without weight-loss surgery or medicines, the study also showed. What are your roadblocks to exercise and weight loss? Take this assessment to discover ways to overcome your obstacles and meet your goals.